I sat on my couch, this morning, and looked at my big Bible overflowing with papers. These papers contained notes of personal struggles, revelations and victories God has given me over the years. Fifteen years to be exact! A lot can happen in one young woman's life between the ages of 16 and 31. Heartbreak, friendship betrayals, college, marriage, children, and the list goes on. It is highlighted and underlined, all representing many moments spent in the throne room of God. Every one of those times spent in God's presence I walked away refreshed, encouraged, and sometimes broken. Hands were raised high, prayer requests wept over and my head face down on the ground has all led me to where I am today. Honestly, I don't regret a minute of it. It made me who I am today, not that I am super impressed with who I am, just thankful I am not where I used to be. A young girl, scared and dreading for her future because I could never see past my present circumstances. A girl who never thought she would amount to much of anything yet became a wife, mother and author along the way. A girl, that allowed that big book to infuse her with strength with every stroke of the highlighter. A girl, that allowed real and lasting change to enter her heart and begin to reveal the woman she was created to be. In retrospect, I can see God's sweet promises over my life whispered to me through the pages of that big book. I am thankful that He held on to me when I was ready to let go of Him. I am thankful for the sweet words of promise whispered to me in some of the darkest moments of my life. 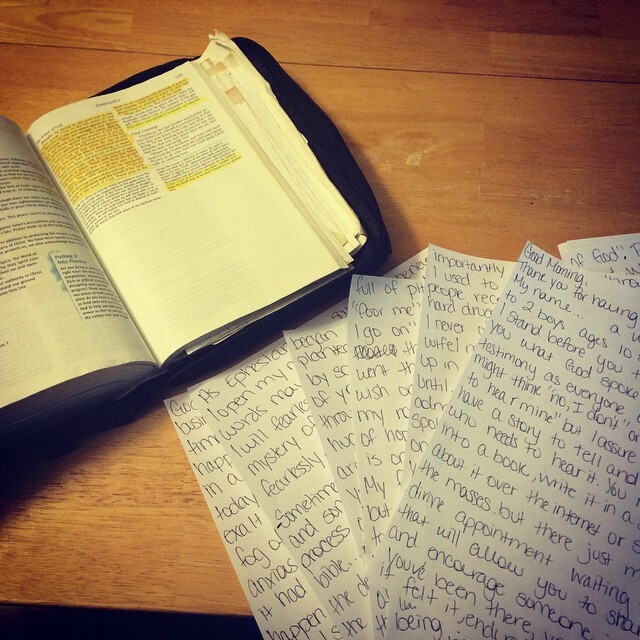 There is just something about holding that Bible in my hands and turning its pages that rival nothing else. My phone only allows me to see one verse at a time and not grasp the fullness of the entire chapter. What came before that bible story? What came after? There is something about holding the actual book that makes me want to read more. Many times I have allowed time to get away from while reading that big book. What treasures does that big book hold for you? When was the last time you read a hard copy version of the Bible in lieu of the digital copy? The digital copies of God's word aren't bad.From my perspective, they just aren't quite as filling as the feast my big Bible has in store for me. The digital copy and the availability of having a bible verse at my fingertips is like having a Dove chocolate on had at all times, sweet, but not filling. Sometimes I am hungry for more. I have heard Beth Moore say "Every single word has a phrase, every single phrase has a scripture, every single scripture has a chapter, every single chapter has a book, and every single book has a testament, and both of those testaments go in one Bible." I encourage you starting today, to open up your Bible and see what that big book has in store for you. you are so right about the big book and the digital. my big book has about 35 years of yellow and pink highlighter marks, tear stain pages, papers of my kids sunday school lessons they made and pictures of christmas programs. it's amazing what Gods and his big book can hold.